The essential four measurements of the curve that have been common (or nearly so) to most popular symphonic mouthpieces over the past many decades are also common to this mouthpiece, but the attention to detail along the curve is considerably greater. Virtually all facing curves that are produced by machine, by hand, or by a combination of both can have significantly different measurements at places along the curve where measurements are not typically checked during production or refacing. When the Caravan clarinet mouthpiece facing is shaped, 16 points along the curve (a length of less than three-quarters of an inch) are checked and made to conform to very precise numerical specifications, some of which hold the key to responsiveness, tonal consistency, and tonal control at all volumes. 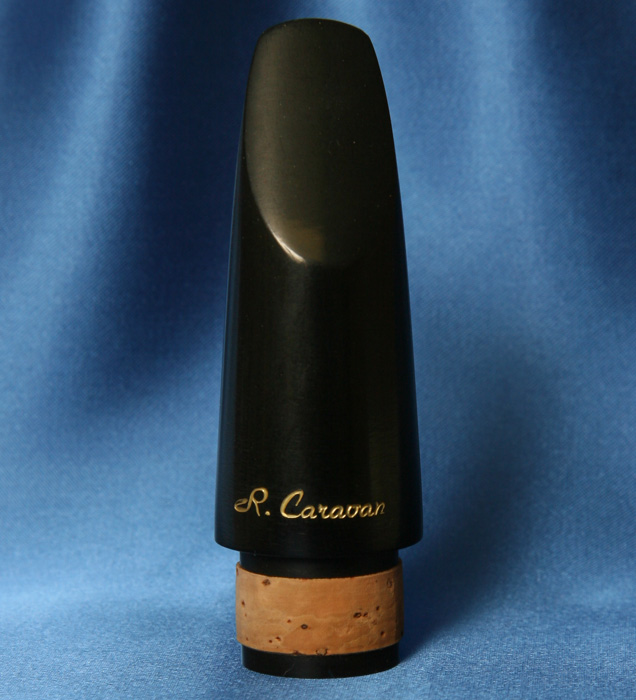 With an interior design that produces a well-balanced harmonic spectrum, a compatible precision facing curve that enables excellent control and response, and somewhat wider side rails that virtually eliminate that common and unwelcome low-register reed “buzz,” the Caravan clarinet mouthpiece embodies a highly desirable set of potential advantages for the serious professional clarinetist or advancing clarinet student. Because this mouthpiece is inherently a little more resistant than many of the popular symphonic clarinet mouthpieces available, a traditional reed strength of approximately no. 3 or 3.5 (VanDoren, D’Addario, or equivalent cut) should be adequate for most players, which will generally make it easier to find and adjust reeds compared to the greater challenges of thicker cane. And the possibility of a little lighter reed notwithstanding, an especially advantageous characteristic of the mouthpiece is that it can accept maximum air for the most intense musical passages without loss of control or “center” in the sound—that is, it is less inclined to “spread” (assuming mature tone-production skills, especially good tongue-position voicing). With compatible reed strength, the mouthpiece can also provide for soft dynamics and gradual decay to silence without significant air noise. FACING BASICS: Tip opening: .039 in. (c.100 in traditional parlance), inside line of tip rail. NOTE: For a series of CD recordings (mid-2016 release) of Ronald Caravan performing on this mouthpiece, the link below accesses a special-package offer of all 8 volumes on the record company's web site (Mark Recordings). Single volumes can be found on their site by clicking “Music Store” on the left side of the screen and then typing “Ronald L. Caravan” into the search field at top right of the screen. Recordings can be purchased directly from the company's web site. CD recordings of Ronald Caravan performing on this mouthpiece.